Our Control Warlock deck list guide features the best Rise of Shadows deck list for Season 61 of Hearthstone (April 2019). 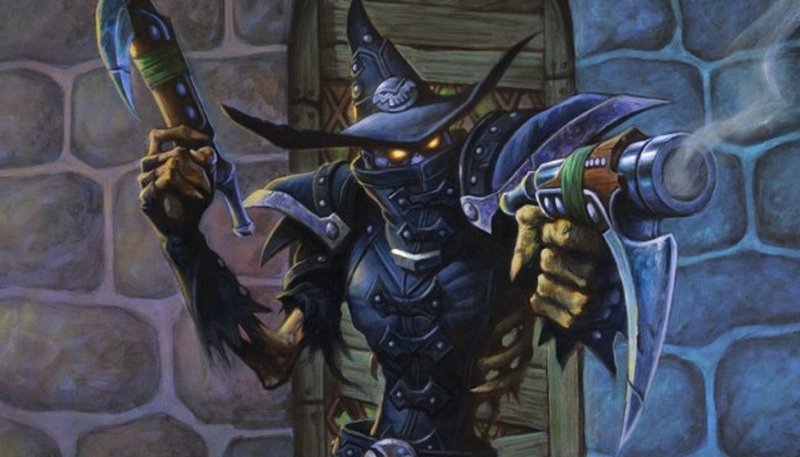 Our Control Warlock guide also contains Mulligan advice, card combos and strategy tips. Control Warlock is a Hearthstone deck that packs in a whole heap of cards from the most recent expansions to provide board clear options at just about every stage of the game, before building up to a big finish in the late-game. It's a mix of old and new here, and it packs an awful lot of intimidating end-game options to ensure your opponent's always under pressure. In the next of our Rastakhan deck guides, we've got a powerful Control Warlock deck list for you to get started with, and some Mulligan advice for starting each match on the right foot. We've also expanded on our strategy advice significantly with tips for dealing with both aggro and control opponents, and also added some thoughts on card substitutions. If you have any questions about playing this deck, let us know in the comments and we'll do our best to help you out! It's going to take some time to fully update Metabomb for the new Rise of Shadows meta, but we wanted to highlight a version of Control Warlock you can play at launch. It was created by Dog. This is the Control Warlock deck that's seeing the most play at this stage of the Rastakhan meta. We'll keep updating this one throughout the expansion era and will have another update for you soon. Control Warlock does exactly what its name suggests: take a defensive approach to the game by answering all your opponent’s threats, starve them of resources and then dominate the late game with overwhelming force through big minions and Bloodreaver Gul’dan. Early game: As with almost any late game skewed Warlock deck, you’ll want to spend the early game using Life-Tap to gain extra resources and card advantage over your opponent. Don’t be too worried about your steadily descending life total. The deck has more than enough healing to bring you back up again. Cheap minions such as Kobold Librarian are also excellent plays to contest the board, cycle through your deck and cause issues for your opponent. Prince Keleseth, as always, is a mightily impactful card when played early on. Mid game: Keep the board under control as you enter the mid game with whichever removal options are most suitable for the situation. Has your opponent gone wide? Hellfire. Playing big single minions? Lesser Amethyst Spellstone. Skull of the Man’ari will get the most value if you can play it on Mana curve – and it’s even better if a Voidlord is already in your hand to drop down on Turn 6. This single minion can completely kill off aggro decks and is a problem for many other lineups, allowing you to take full control heading into the late game. Late game: Now it’s all about finding your win condition. If you’ve starved an aggro deck of their resources then you can simple whittle them down if they don’t concede first. If you've played and lost big impact cards like Doomguard, then Bloodreaver Gul’dan refills your side of the board with all expired Demons and grants you a powerful new hero power to boot. 1. Even though they may be playing fast, using Life-Tap in the early turns is still the best play. You have cards like Hellfire and the splash damage of Despicable Dreadlord to help whittle down the board later on. 2. You’re also flush with healing in the deck, so all that chip damage from little minions can be restored in no time. 3. The sooner you can get a Voidlord out the better your chances of winning, but be careful of running into a Silence effect that will completely negate the minion's sticky state. 1. As it’ll be a slow start for both of you, Life-Tap your way to as big a card advantage as possible. 2. Time your Gluttonous Ooze to devour their most effective weapon if you can, and take that advantage away from them. 3. You have multiple ways to deal with their biggest threats too, including Lesser Amethyst Spellstone, Shadowflame and - in certain cases - Spellbreaker. These are the cards you’ll want to dig for in your opening hand when playing Control Warlock. 1. Prince Keleseth: An incredibly powerful minion that buffs the remainder of your deck. The earlier you get this into play the better. 2. Kobold Librarian: A ridiculous one drop that can contest some two drops while also drawing you a card. 3. Skull of the Man’ari: Such a strong card for bringing your late game demons onto the board early on that it’s worth keeping in the opening hand - even at five Mana. There are lots of important combos to consider in this deck, so take a bit of time to study the list carefully! - Don't worry about the negative side of Kobold Librarian as it provides incredible value, particularly in the early game. As a Warlock you should be well used to sacrificing your Health for the greater good by now. - Don't forget that the damage impact on Hellfire not only hits your own minions as well as your opponent's, but both heroes take three points of damage to the face as well. - Drop Gluttonous Ooze onto the board and your opponent's weapon will be obliterated. You'll also gain Armor equal to the weapon's Attack value. - Lesser Amethyst Spellstone costs four Mana, does three points of damage to a target, and restores three points of your Health in its vanilla state. Take damage from one of your cards and the value increases to five. Take more damage and it tops out at seven damage/restoration. - Once Skull of the Man'ari has been equipped a randomly selected Demon minion will be pulled from your hand and added to the board at the start of your turn. - Any cards discarded with Lakkari Felhound can be recovered through the effect of Soulwarden. - Do your maths carefully before playing Lord Godfrey and make any trades (partial or otherwise) that will cause him to have the greatest effect. He works a bit like Defile, but the damage value is increased to two in this case. - When you play Bloodreaver Gul'dan, your board will be filled up with Demon minions that died earlier on in the match! You'll also gain a new Hero Power which lets you target three points of damage and restore three points of health simultaneously. Gnomeferatu: A perfectly OK two drop so it fits into the deck easily, but that added bonus of discarding one of your opponent’s cards is a nice touch that can sometimes turn a game on its head. Gluttonous Ooze: Good if you keep running into weapon heavy decks, but you can get away with Acidic Swamp Ooze if you want a cheaper option. Perhaps worth swapping for a Shadowflame if aggro is more prevalent, however. Skull of the Man’ari: As the deck only runs one demon, this will get a Voidlord out three turns early, which is usually far too difficult for many decks to deal with efficiently. Rin, the First Disciple: An important part of your win condition against other control decks. Lord Godfrey: A Defile on steroids. Also, it leaves a 4 / 4 body on the board once the effect ends, which is nice. Twisting Nether: Straight up hard removal. It’s expensive but you run two so you can use them a little more freely, rather than waiting for a massive board to clear. Shadowflame or even a Doomsayer are both OK replacements if you just want to run a single copy. Voidlord: A very annoying Taunt minion. Just stalls and delays anything it stands in front of, especially with the three Voidwalkers that spawn upon its death. Bloodreaver Gul’dan: Fills your board with a wall of Taunt minions. It also gives you impressive late game reach with a hero power that both damages and heals. @mikekoopmans50 this deck was pretty good for the early release of the game but as it got later into the month it became harder to win. Its still a good deck and is really fun to play around with, but unless you have extra dust laying around i would wait and craft another deck. Control paladin has been working pretty well for me but there are plenty of options now that we are getting a grip on the meta. @TheJackKetch Let me have a word with our tech team and see if that's a functionality we can add to the site.